Small Metropolitan Tool Kit has an assortment of essential tools.Small Metropolitan Tool Kit this compact, practical and stylish tool kit will fit just about anywhere you may need it! With an assortment of essential tools you will be able to handle any repair or emergency. Includes 25 pieces: Long nose pliers, 3 Phillips screwdrivers, 3 slotted screwdrivers, 10 screwdriver bits with holder, screwdriver extender, screwdriver handle, 4 sockets (7mm, 8mm, 9mm, 10mm), tweezers, wire cutters. 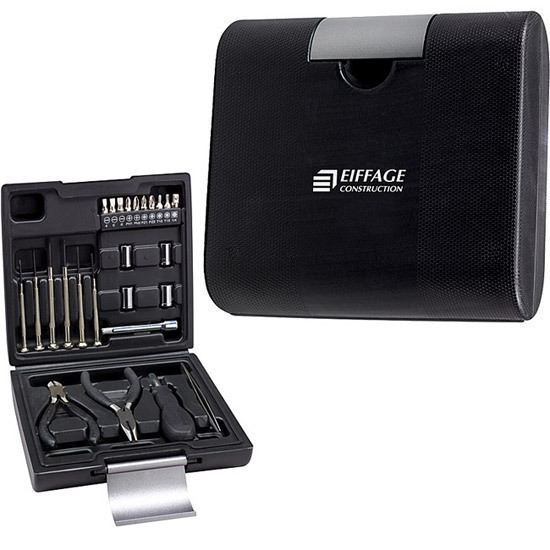 Sturdy, stylish plastic case with molded compartments for tools.